Knowledge = Money In The BankEliminate The Muda! Here is a story about how a little knowledge can save a lot of money… maybe? Three long days of seafood, shopping and sun. It was the annual women’s weekend away. Dad’s were given their lists of chores and schedules, kissed on the cheek and left in the dust. By all accounts the ladies had a great time. On the home front, the men were focused on maintaining clean and efficient homes (at least one of us was) while taking care of a little business when the kids were in school. This article was included in the Best of Money Stories Carnival hosted by Personal Finance Journey. Be sure to check out the other great links! As the weekend approached the weather began to warm. On day two of the vacation Dad 1 called to inform his wife that the A/C was on the fritz. It would take 3 days to get a technician to inspect it. On day three, I discovered that one of our units was out as well. What are the odds that two people from different cities would be on vacation and both experience HVAC problems? A technician arrived to inspect our system. Within minutes the leak detector was out and passed over the coils of the evaporator (The machinery inside the house). A slight increase of the cadence from the detector elicited no reaction. Of course, to the novice such as me, any change in sound just means more money. On the outside unit, the condenser, gauges were attached and we immediately discovered the system was empty of refrigerant. No wonder finding an obvious leak was difficult. A small amount of freon was injected before the top of the condenser was removed. A few waves of the wand were all we needed to find a definite but not extreme reaction from the leak detector. Of course, the leak is coming from the single most expensive component of the entire system, the compressor itself. So the root cause is a hole that needs to be closed. The technician implied that these older obsolete units are near impossible to find replacement parts for. Even then, he claimed, for the price of a replacement part he recommended an upgrade from an R22 system to the new R410 standard. The price, he said, wouldn’t be that much different. Ten minutes online revealed that an upgrade is not mandatory and that replacement parts can be found. Compressors cost about $900. R-22 Freon should be in the $40-$50 range. Labor varies. While this job is quoted at a flat rate, this company charges $185 per hour. A complete system runs $1,500 (Excl. Labor). Pros – lowest cost of entry. Cons – Violation of EPA regulations at worst, wasteful at best considering it is only a matter of time before it leaks out. Pros – Less than full replacement cost and permits continued use of existing equipment. Cons – Risk – Remaining equipment lifespan is unknown. 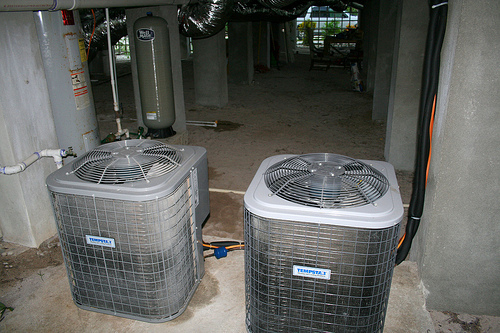 Pros – Convenient and provides greater reliability in near future. Improved efficiency, reduction of utilities. For our friends the situation was a little different. After waiting for a few days their technician found their system was still full of freon. There was no leak; the problem was the capacitor on the motor. A capacitor is simple device that stores an electrical charge which is then used to make the motor more efficient. In less than 5 minutes I found online that capacitors are priced in the $25 range. Replacement of this component is a twenty minute job at best and annual service contracts can be found in the $400 range. 1) Wait three days for the repair to be completed for $800. Their technician suggested a replacement and an annual contract for maintenance to help reduce the chances of unexpected failures. Readers: We have two totally different situations. Who is getting ripped off and how can you tell? Put yourself into both situations what would you do in the first or in the second? 5) Ditch the house AC and get window units for the most used rooms (probably not more than 1 or 2). On the second one I go with the idea that unless you know something about what you’re insuring that the company doesn’t (specifically it’s error prone) it’s probably a bad deal for you. How many fans could you buy with $2,800? .-= Ryan @ Planting Dollars´s last blog ..Adding Content To Your Travel Site – Waikiki Site =-. @Jacob – To ditch the A/C would require ditching the wife and that is something I can definitely NOT afford! #5 however is an option but wouldn’t work, it would take too many. On the second one, it was a routine service agreement, I should have been more clear. Across the board, it was a rip-off. @Ryan – In the deep south you could never buy enough. You may not need, but you want A/C.